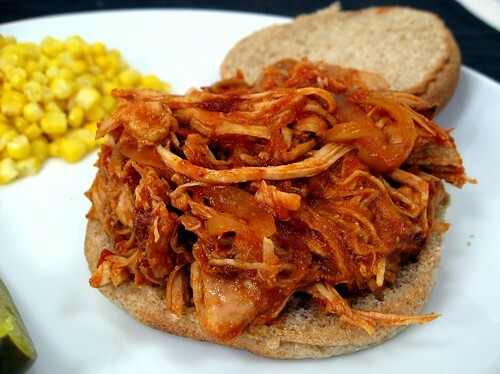 Slowcooker Pulled Chicken – Elly Says Opa! I have big news to share. I used my crockpot twice within TWO days last week. I know, right? Amazing. And SO nice! The day prior to making this, I made an absolutely huge pot of beef stew (I could barely jam the lid on). My goal has been to start working on some meals that I can double up so we eat them for dinner and then I have leftovers to freeze for when the baby comes (which is supposed to be in like 3 weeks, eeek!). I had this recipe saved in my Reader when I first caught it in Apple a Day because I loved the ingredient list and especially liked that it was a homemade barbecue sauce without the use of refined sugar. 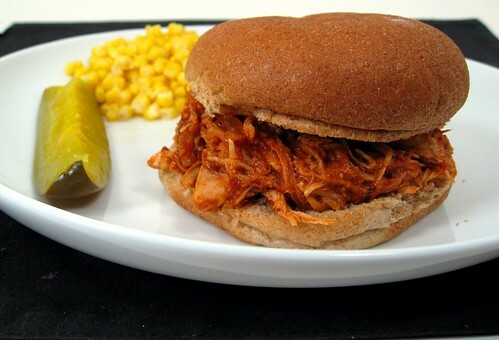 Call me crazy, but I actually prefer pulled chicken to pulled pork and the fact that this was made with chicken and healthy to boot sealed the deal. I liked that Kelsey used chipotles in adobo (one of my favorite ingredients, as you know) in the sauce, rather than a can of diced green chiles and chipotle powder. The chipotles give this sauce a nice smokiness and add some more heat. I also added some aleppo chili powder, which is slightly fruity, to complement the honey, and some cayenne for a little more spice, too. The sauce does has a little kick (which we love) from the chipotles and the cayenne, but I wouldn’t say it’s overly spicy. Just use your judgment and use less chipotles or cayenne if you don’t like a lot of spice. We both really liked this and I especially loved how easy it was. I made the sauce the night before, as well as slicing the onion. Neither takes particularly long, but I figure why not get some prep done ahead if you can, especially if you are making this on a workday (which I was). It took me less than 5 minutes to press some garlic and throw everything all together in the slowcooker before work. Whisk together the first 9 ingredients (through aleppo chili powder). Spray your slowcooker lightly with oil and then place the chicken inside. Season the chicken with salt and pepper. Scatter the onions and garlic evenly over the top, and then pour the barbecue sauce over the top. Cook on low for 5 hours (I just let mine go all day while I was at work, so closer to 10). Shred the chicken with two forks and, if desired, continue to cook for a little bit on high, with the lid off, to allow mixture to thicken.